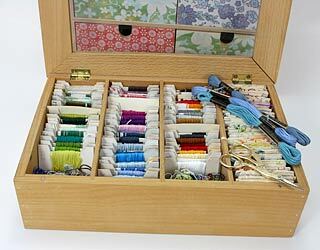 What’s the best way to store embroidery threads? 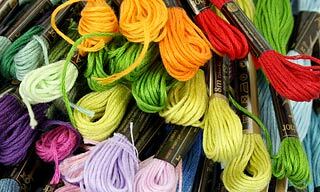 Having organised and accessible threads makes all the difference to an embroiderer’s life. You can easily find the colour you need, and see when you have run out and need to replace one. 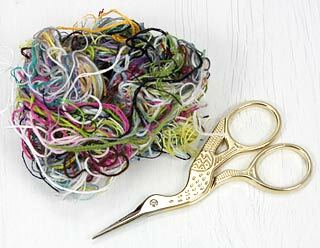 A selection of neatly stored threads is satisfying and inspiring, whereas a messy tangle of jumbled colours would put you off even starting a project. I use my threads every day and go through two or three hundred skeins in a year. My most often-used colours are old friends and I know all their shade numbers! I really need a good system to keep track of my threads, and to stop me running out of my most-used shades. There are many different ideas out there (I like the wooden clothes-pegs method) and you can buy all sorts of decorative bobbins to wind thread onto. If you only use a few shades you can have fun storing them on a sheep, a butterfly or a unicorn wearing roller skates . Or you can download printable templates to cut and decorate your own. I’d love to have cats’ ears and faces on all mine, but realistically that’s not going to happen! More conventionally there are plain card or plastic bobbins, but the plastic boxes to fit them are rather ugly and there’s really no need to buy them as you can make your own from card. 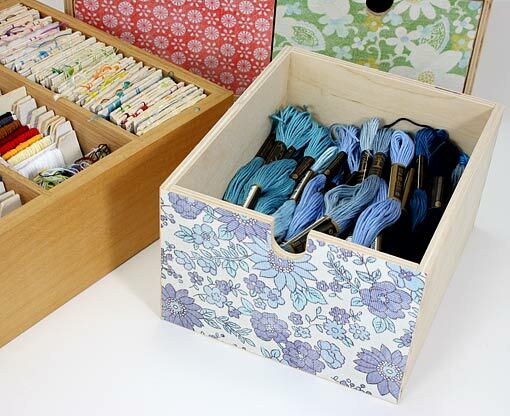 Find a container first, then cut your bobbins in a suitable size and shape to fit it. A pretty tin or a wooden box can be divided into sections with strips of thick card. I looked at various methods suggested on other blogs and websites before writing this, and found many ideas for storing individual colours, but as I use stranded thread, and always split the thread into one, two or three strands before sewing, I need a system for keeping all the separated strands organised as well. Obsessive, but necessary! Also, I cut my lengths as I go along, depending on what I’m stitching, so the systems used for cross stitch and tapestry where you cut your skein into equal lengths then twist or braid it, don’t work for me. So here is my system. My thread box came from a continental supermarket and was intended for storing selections of teabags. 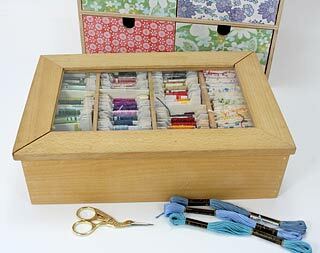 The divided sections are the perfect size for thread bobbins, and the lid keeps the dust out. I cut pieces of card to fit the sections, and cut a little way into the edge at each end to make a notch to secure the end of the thread. I write the shade number on the card. Three sections of the box are filled with these bobbins of whole thread, wound straight from the skein. I keep my most-used colours at the front in their own section, but you can order them by colour or shade number. On the right-hand side is the section for divided threads. I cut a piece of card and snip three notches along the top and bottom, write on the shade number, then wind 3-strand pieces at one end, 2-strand pieces in the middle, and 1-strand at the other end. When I’m sewing I can easily find the colour I need, in whichever thickness, so I can go straight to one-strand gold 303 to embroider stars on an elephant’s saddlecloth, or three-strand blue 130 to stitch a dog’s jacket. I have three separate cards for white, as I use it most often, and always have lots of left-over lengths. Any leftover threads that aren’t long enough to be worth winding on card go in the birds-nest tucked into the front of the box. (A little organised mess is allowed!) If I need a small length I check through the birds-nest first and use up these bits, and that keeps it at a manageable size. I order my thread by post from the UK as I can’t get the full range of colours I need here, so because of shipping costs I buy lots at a time. 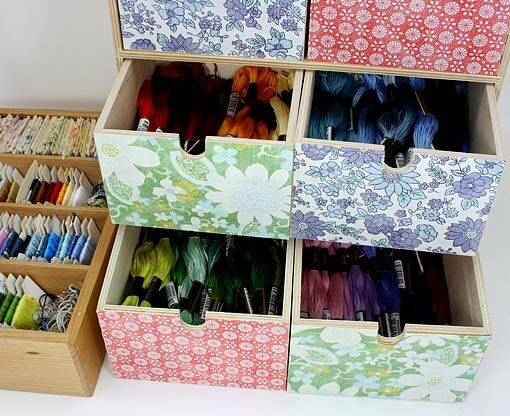 The spare skeins live in this small Ikea chest, and I have a list of colours with the shade number and sometimes a note of what I use them for, for re-ordering. I always use the top-quality thread from either Anchor or DMC, as it’s less knot-prone and more light-fast than the cheaper brands, however tempting those large selection packs are! I do get bulk packs of black and white Anchor stranded cotton on eBay though, which are a lot cheaper than the individual skeins. 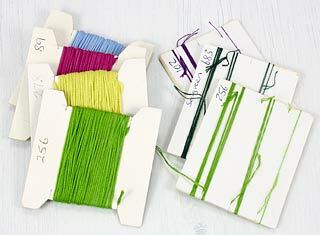 To divide your thread into strands, first cut the length you need for sewing. It’s always worth using two shorter lengths rather than one very long one, which is harder to work with and may get knotted. Starting in the middle of your cut length, hold 3 strands between thumb and finger of each hand and pull the sections apart gently and slowly towards each end. Don’t rush or force it, or the thread may twist back on itself and get tangled. If your thread persistently refuses to go through the eye of the needle, try threading the other end, as the fibres may lie flatter in one direction. Or just snip off the end and try again. I don’t use a needle threader but I do need my glasses!